When disaster strikes your home or business, you need an emergency cleanup and restoration team available any time of the day or night, 365 days a year. Our team of professionals can handle all your needs for water damage restoration in Denver and provide support during your time of need and relieve your worries by ensuring all aspects of the project are done right. At Project X, we're committed to our community and you. Locally owned and operated, we have over 135 years of combined experience performing water damage restoration in Denver, an A+ BBB rating and back all work with a guarantee. We're proud to be Denver's trusted choice for cleanup, restoration and remodeling. 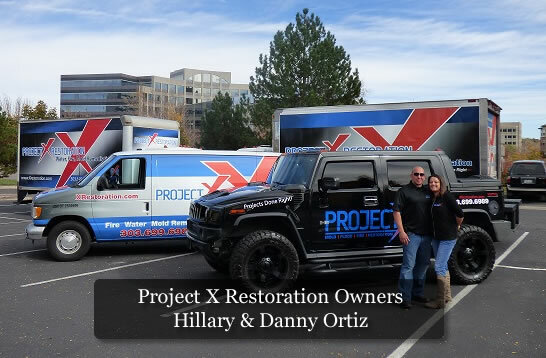 Mold, water, flood or fire – Project X has the restoration experience and latest equipment to take on any project for homes, businesses or multifamily properties in Denver and throughout the state. Whether it's a backed up sewer line or weather related flood, we can be on site to handle water damage restoration in Denver, in an hour or less, to stop the water damage from spreading. Project X offers fast and confidential biohazard cleanup for extreme cases, including hoarding, meth labs and any situation where blood and bodily fluids pose critical health issues. A fire in your home or business can be a devastating. That's why we provide 24/7 emergency cleanup, smoke damage control and repairs to get your life and livelihood back together. A home with mold issues can lead to health problems. Let Project X put your mind at ease and ensure your family is safe with full-service mold inspections, removal and remediation. Asbestos is an inherent risk when renovating or restoring one of Denver's older homes or commercial spaces. Trust our asbestos abatement and removal team to get you back on track. Rely on Project X for any remodeling project, from repairing tenant damages to restoring your home after a fire or flood. We'll even work directly with your insurance company. Fire or flood, high winds or vandalism. When you're facing a crisis, we'll provide emergency board up services to protect your home or business from the elements and break-ins. Protect your health with truck-mounted, steam carpet cleaning services from Project X in Denver. We specialize in stain and odor removal caused by everyday use, pets and more. Whether you, a loved one or even a tenant are facing this type of cleanup, you can trust the team at Project X to be compassionate, discrete and professional at every step.